Hi. Welcome to Earned Value Management Basics. I'm Les Chambers. From the beginning it's never been easy to deliver a systems project on schedule and on budget. And it gets harder as projects get larger and systems become more complex and life critical. We're often integrating diverse and untried technologies with large multidisciplinary teams. If you're a project manager you struggle to understand what progress is actually being made. What ARE you getting for what you're spending. Maintaining visibility of progress is a challenge if you're developing software. If you're a construction manager you can measure progress by watching your building rise from the ground. But if you're a software development manager you've got nothing to watch. Software's invisible. Its an abstraction. An idea. It can't be viewed ... like concrete. How much did that component cost? What is your percent complete? What is your estimate at completion? Why are we behind schedule? Will you be finished on time? Are you in this nightmare? A hungry project team burning thousands of dollars per day. The customer asking questions. And you're searching for answers in an information wasteland. And worse ... explaining to the government ... where the money went. 1965 and the folks of the US Air Force's Ballistic Systems Division are wondering if there's a better way to manage projects. The traditional approach of comparing actual spending against plan isn't working for them. They're generating lump sum budgets and time phasing them over the life of their projects. Producing S curves like this one. They're tracking performance over time by comparing actual spending against plan. The budget's exhausted but the work's not complete! We're still spending. Explain that to the customer. Spending only measures economic activity. It doesn't quantify productivity. What we need is visibility of progress for the money. Get early warning its happening around here ... then take action to prevent this. Earned Value Management ... it was born out of a need to quantify what's actually been accomplished on a project and to predict costs to complete. The Air Force applied it to the Minute Man Missile Program and it's since become a mainstream management science adopted by international professional bodies such as the Project Management Institute. It's also the subject of several international standards. So ... why should you spend time learning how to apply Earned Value Management? Thirdly its considered "best practice" by Professional bodies such as the Project Management Institute. Suitable for all classes of project large and small - even software. Predictability is Earned Value Management's greatest virtue 40 years of evidence collected over thousands of projects employing Earned Value Management have demonstrated a pattern of predictable behaviour. For example we've discovered that a project that's overrunning a the 15% complete mark will not recover without a scope change or other intervention. In fact the percent overrun at completion will likely be greater than the percent overrun to date. So if you're behind schedule or over budget, Earned Value Management gives you early warning so you can take corrective action. And the operational phase where we deliver and operate our system. In the planning phase we place an estimated (or planned value) on all work to be performed (in our example lets say $30,000). Then when the product is delivered the same planned value of $30,000 is considered to be "earned". Earned value then provides a number that gives a true indication of value delivered and hence progress made. Let's look at an example of how earned value can be calculated across all the components of a system as a project progresses. Let's say we're developing a multifunction display system with two major components: the display hardware and some software. In the planning phase of the project we estimate how much both components will cost and when they'll be delivered. We call our estimate the planned value and we can plot it's cumulative value over time. We call this time phased budget the PERFORMANCE MEASUREMENT BASELINE. In the development phase we design and build our components. When we've completed the MFD hardware we claim we've earned its original planned value. On delivery we call this our earned value. In this case the MFD hardware was delivered later than expected. We're behind in our earnings by this dollar value and by this time period. We've also tracked our actual cost for this component and we compare it with our earned value. Actual cost is a measure how much we've spent to convert planned value into earned value. In this case we've spent more than we've earned. We continue our software development but miss our planned delivery date. 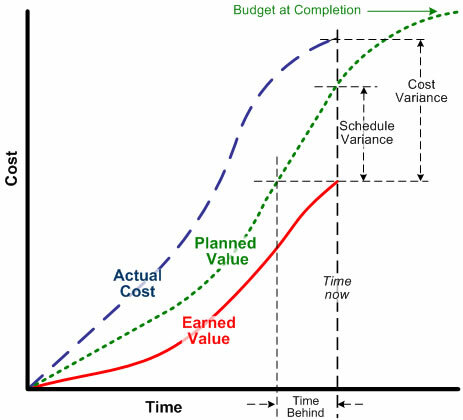 Comparing the earned value and planned value curves we can see how late we are in time. We can also see how many dollars we're behind in our earnings. In addition, comparing the earned value and actual cost curves we can see if we're under or over budget. Notice that comparing actual spending with planned spending doesn't give us an accurate picture of performance. For example, at this point in the project comparing actual with plan indicates we’re pretty much on track. This turns out to be wrong. When we compare actual spending with earned value we discover we've got a substantial cost overrun. The true status of our project can therefore only be determined by measuring what we've actually achieved for the money - this is the essence of earned value. OK ... so how will Earned Value Management help you better manage your projects? What's changed in today's world that makes Earned Value Management techniques so useful? Projects have always been risky but right now they're larger, more complex and more critical than ever before. Failure can destroy life and property or even bankrupt a company. Here's the core project risk: when the time line passes over a period where your team is not performing at its expected efficiency the money lost can usually never be recovered. Hence the urgent need for closer monitoring and tighter control. Projects are fixed scope, fixed time journeys. Armed with a fixed budget, unlike continuous business operations, you get one chance to get it right. Projects are stories that arc from a beginning to an end. Retold endlessly in infinite variation. But viewed through the lens of Earned Value Management they all have the same patterns, the same success factors and the same failure modes. We take aggressive management action to stay on track. Armed with master schedule milestones and WBS estimates we create the time phased Performance Measurement Baseline. A project also needs a mechanism for tracking performance in real time. We achieve this by allocating responsibility for developing WBS elements to organisational groups and create cost accounts to accumulate and track earned value and actual costs. In future sessions we'll cover cost account planning including several methods for calculating earned value. With the Earned Value Management framework in place we can now provide quantitative answers to the stakeholder questions we covered at the beginning of this session. What is our % complete? The project is a call to adventure. It CAN be a hero's journey. In the following sessions we'll cover Earned Value Management professional practices in much greater detail. I'll give you practical step by step instruction on applying Earned Value Management in any project large or small. Properly applied, Earned Value Management will improve your ability to control projects ... all by having clear visibility of what you're getting for what your spending. Earned Value Management (EVM) is a project performance measurement technique that provides an accurate comparison of the actual work performed against that planned. It achieves this by placing a baseline value on each deliverable at project commencement and crediting the project with that value when the deliverable is completed. This facilitates early identification of variances from plan allowing management to take corrective action before problems escalate. Establish the baseline plan. In the planning phases of a project a target value is assigned to each scheduled element of work (usually some physical deliverable). This is called the "Planned Value (PV)". Allocate earned value. As the elements of work are completed their original Planned Values are classed as "earned", hence the term "Earned Value (EV)". The cumulative Earned Value across all completed work elements provides an accurate measurement of the value of work performed at any point in time. Measure variances from plan. Project performance can now be measured by comparing Earned Value with what has been spent to perform the work (Actual Cost - AC) and what was scheduled to be accomplished (PV). Refer to Earned Value Variances. Determine the criticality of variances. Earned Value indices provide further insights into the relative magnitude (and criticality) of cost and schedule variances. Refer to Earned Value Indices. Forecast project outcomes. Earned Value metrics can also be used to forecast the outcome of a project. Refer to Earned Value Forecasts. The EVM technique is used in project management only. EVM metrics assume a project with a fixed set of deliverables conducted over a defined period in time. EVM is therefore not useful in managing continuous business operations. Percent of project work complete. The cost performance index required to complete the project on budget. Comparing CPI and TCPI at any point in a project gives a unique insight into the likelihood of a project completing on budget. For example if a project is running at a CPI of 0.8 with a TCPI of 1.2 required to complete on budget; such a step change is unlikely without major management intervention. The estimated total cost at project completion. The estimated variance between actual total cost and planned total cost at project completion. 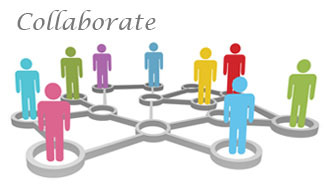 - Exchange ideas with our member community.